Ahoy and yo-ho-ho! 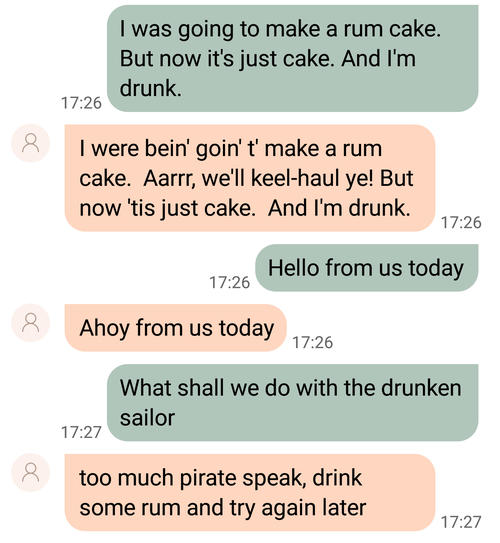 In celebration o' International Talk Like A Pirate Day, let's build a SMS Pirate Speak translator with Azure Functions, the Fun Translations API and, of course, Twilio. 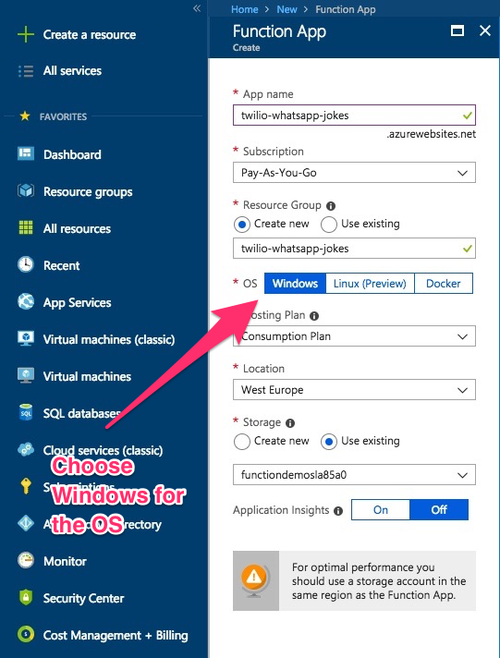 Give your app a name, I called mine twilio-sms-translator, create or reuse a resource group, and choose the Location that best suits you. You can then click Create at the bottom of the panel. Once the new resource has deployed, go into Functions from the menu on the left. If you can’t see Functions then click on All services below Create a resource, search for Function Apps, and then click the star to the right of the result to favourite it. Now it should be on the panel on the left. The link will take you to a screen with loads of template types. The one we want, HTTP trigger should be first. Select the link for C#. A panel will slide out from the right of the screen asking you to name your function. Do this and then click create. On the far right, you will see a panel, expand this and click on the View Files tab. Add a new file called project.json to enable us to bring in NuGet packages. Once added, copy and paste in the code below then save it. Let’s add another file to the function called Translator.csx. In this code, we are using an HTTP client to make a call to the Fun Translations API. If our call is successful, we deserialize the returned JSON string, casting it to a dynamic object and then return contents.translated. //Fun Translations API rate limits to 5 calls an hour unless you are using the paid for service. Click on the run.csx file. This is our entry point where we will handle the incoming API call. The message data from Twilio will come in as form data, so we need to split it and add it to a dictionary. In this case I've called it formValues. We can then extract the Body of the incoming SMS from that dictionary. Now that we have the Body from the SMS, we can call our GetTranslationAsync method and pass in the value. 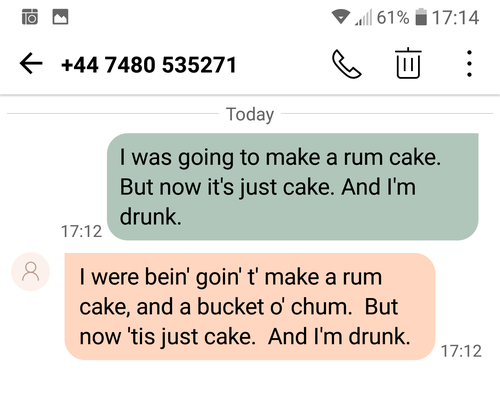 All that's left to do in our function is create a new MessageResponse, pass in our pirateSpeak translated text as the new message body, and return it to Twilio. 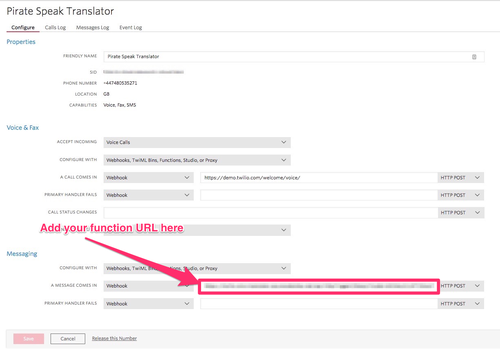 Now that we have our function functioning we can add the URL we saved earlier to our Twilio number configuration. Send your Twilio number a phrase you need translated and you should receive some Pirate back! If you get too piratey, requesting too many translations, Fun Translations API will cut you off with a 429 Status Code, or Too Many Requests, so we've handled that too. The Fun Translations API has several cool APIs to play around with from Klingon to Pig-Latin, so why not make some other translators? Azure Functions on the Consumption plan will scale automatically so they are also great for sporadically high-load jobs. 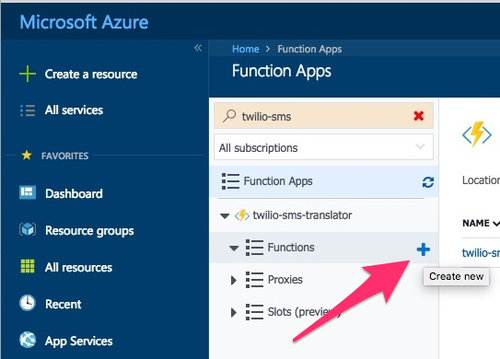 Let me know what cool ideas you have for Twilio and Azure Functions with and feel free to get in touch with any questions. I cannot wait t' see what ye build!